Grab a gal friend and come join the Houston, Texas Freeing She Community as we get together for networking, laughter, and good vibes. We meet monthly at local establishments, bringing together ambitious, inspiring women. All are welcomed: recent graduates, established career women, creative entrepreneurs. Freeing She and WE Hueston welcomed many amazing ladies into The Woman's Earth, also lovingly called "Sacred Self-Love Space for Healing," to enjoy an evening of sisterhood and creativity. Jai Pierre Raven, a Self-Love Advocate and the founder of The Woman's Earth, created the space with the intention of providing a sacred and safe place where women can learn, evolve and heal while being supported and having fun! "The holistic benefits are amazing and the sisterhood you gain is powerful," Jai believes. I absolutely agree and we are thankful for Jai welcoming our tribes into her sacred place! Keep reading to learn more about the celebration of sisterhood that occurred during the 50 Shades of Rosé paint & sip on July 29, 2017. The 50 Shades of Rosé themed-event was a celebration of sisterhood and femininity. The shades of rosé and the creation of art is a beautiful reflection of the diversity in sisterhood and the creativity that women bring to this world. Each lady brought her favorite bottle of rosé to share with one another. 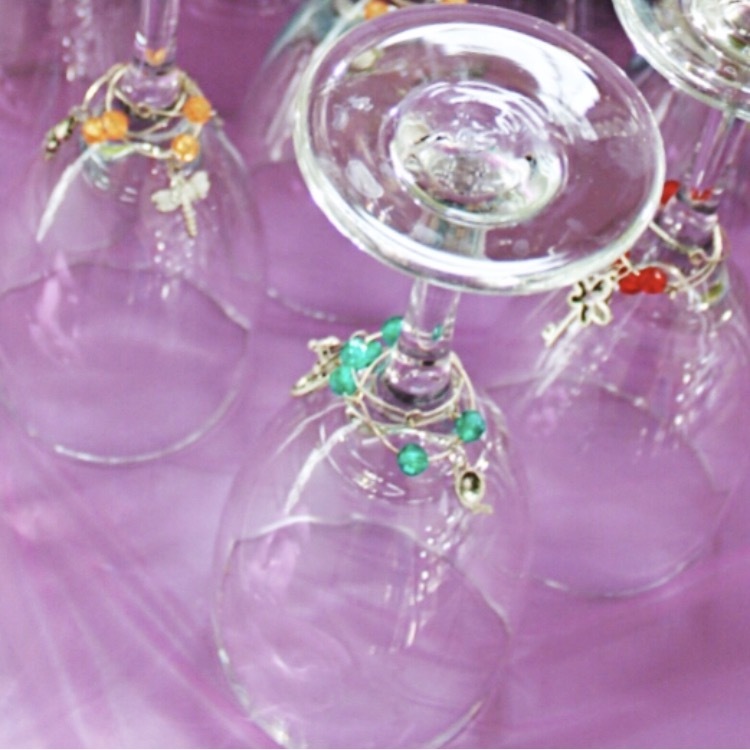 As each woman arrived, she was given several wine charms and the intention to meet 3 new people, exchanging charms as she learned of something she had in common with her sister. After mingling and grabbing a glass of rosé, we all had our seats for the painting fun to begin. Bernice, our paint instructor, guided us through the steps to paint a beautiful image of bold flowers surrounding a blush path. The image was perfect for an event that catered to women who are forging their own paths in life. Once we finished our painting session, we had the opportunity to mingle some more, grab refreshments, and refill our glasses with more yummy rosé . Then it was time for a group picture to showcase our masterpieces! I can't wait until the next event! Check out the pictures below! If you haven't already, make sure you sign up for my newsletter so that you do not miss out on the next Freeing She Meetup!